Hi buddies!!! In diwali we all rush to prepare different snacks and desserts, while karanji requires a little more time and hard work. 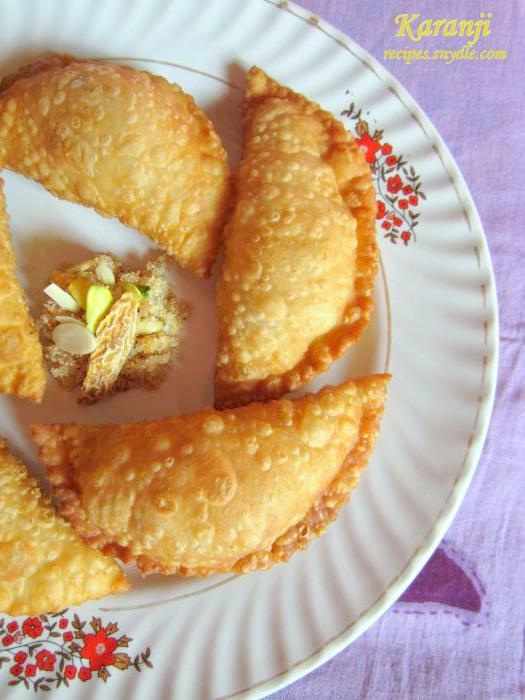 Scrumptious semicircular diwali dessert. 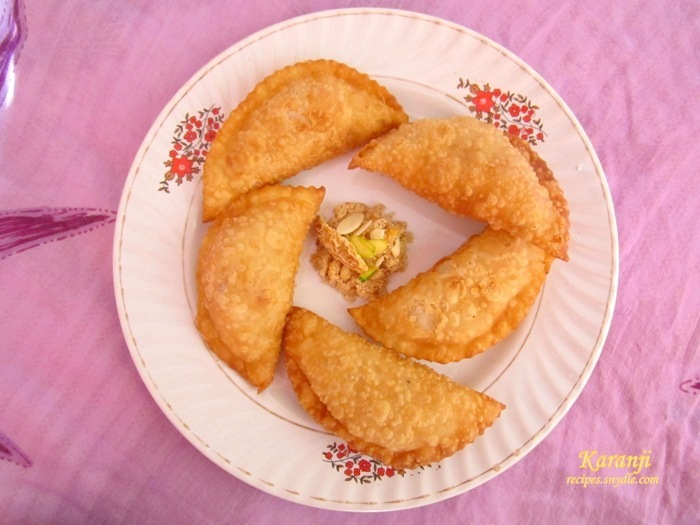 Here, I am sharing my mom’s special recipe for karanji. Even I and my mom make karanji on Rajab. 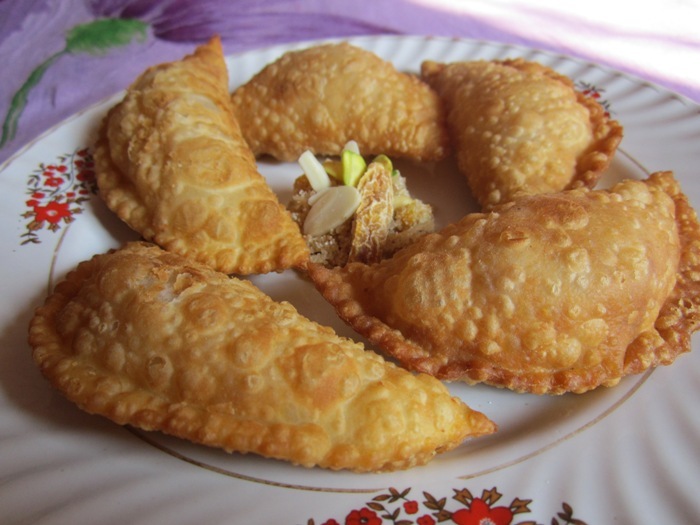 Rajab is the momedian festival, on this occasion karanji is had with kheer and it tastes delicious. 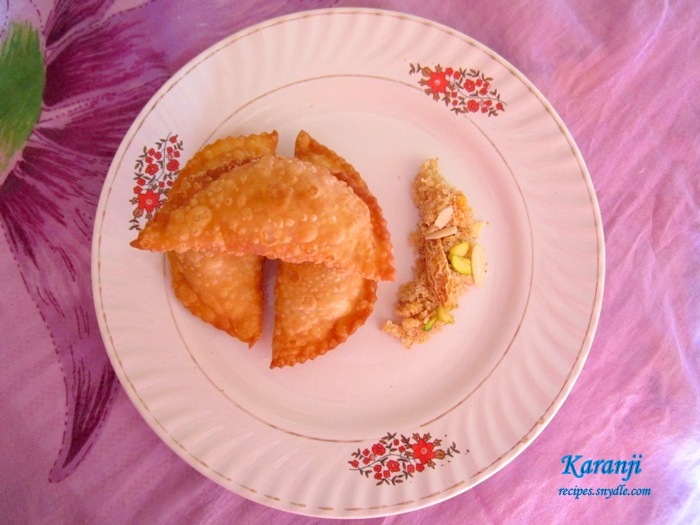 Karanji contains the rich flavour of roasted – unsweetened coconut flakes, rawa/sooji/semolina, dry fruit and cardamom powder. 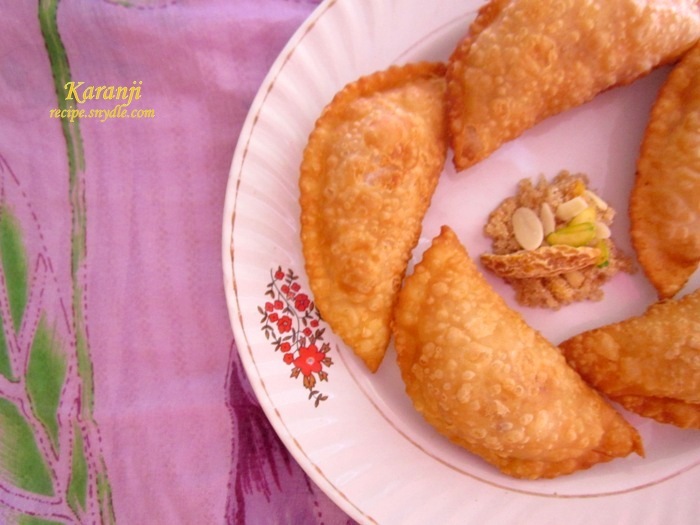 Avoid powdered sugar/icing sugar/pitti sugar to stuffing as karanji could be stored for few weeks and it might harden the stuffing in couple of days. Now u must be having question that how will sugar melt? Relax!! While preparing the stuffing water is added to it, so half of the sugar melts and rest at the time of frying with the help of heat. Whereas dough should be of medium consistency not be too soft or stiff. 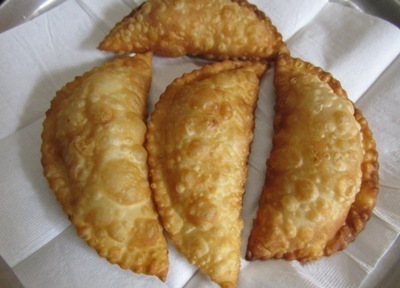 Corn flour makes the outer cover of karanji crispyyy. 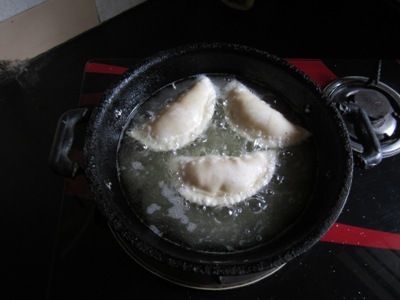 Now lets see how to make karajis/Gujias. For the purpose of measurement, 1 cup = 250ml. Heat 1 tbsp oil in a skillet on medium flame. When the oil gets hot. 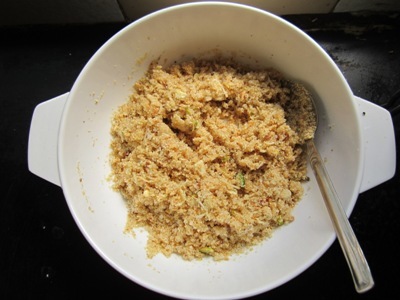 Add unsweetened coconut flakes, cashew nuts, pistachios, almonds, Buchanania lanzan/Charoli nut, dates and poppy seeds into the oil and reduce the flame to low. Stir continuously until it gets golden brown color. Remove it into a bowl. 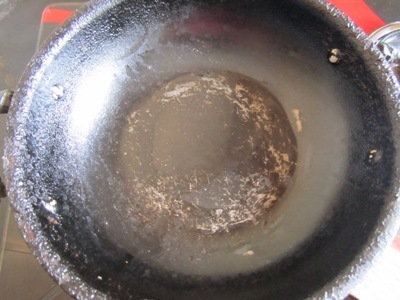 Heat 1tbsp oil in skillet at medium flame. 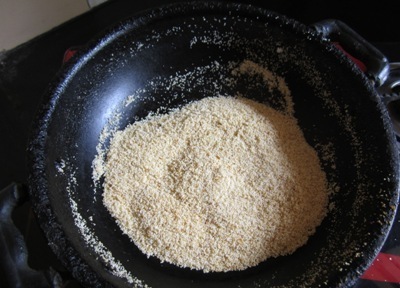 Add rawa/semolina into the oil and stir continuously until it gets golden brown color. Remove it in the same bowl. 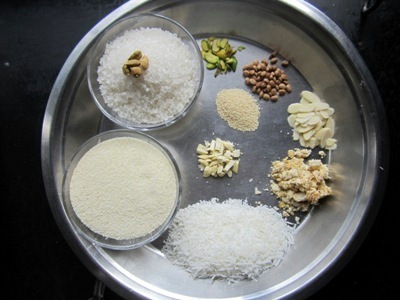 Add sugar, cardamom powder and ¼ cup water to the same bowl of unsweetened coconut flakes, dry fruits and rawa mixture. 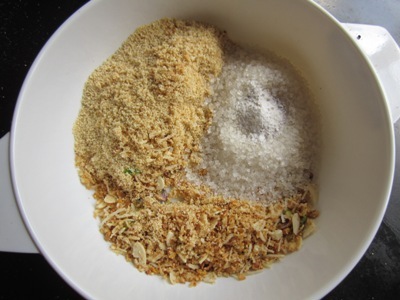 Mix it well and allow the mixture to rest for 15 – 20 minutes. Now the stuffing is ready. 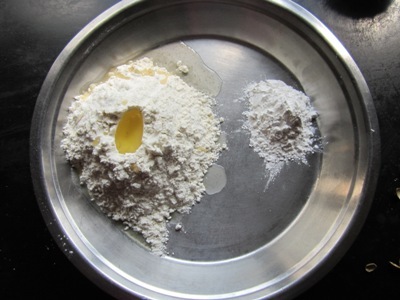 In a plate take maida/refined flour add corn flour, oil and salt. 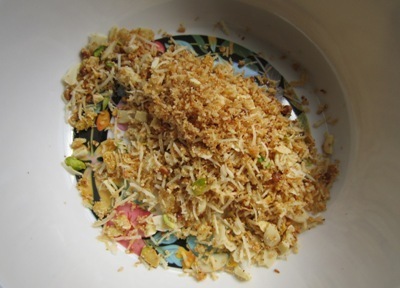 Mix them with your palm till the mixture becomes crumbly. 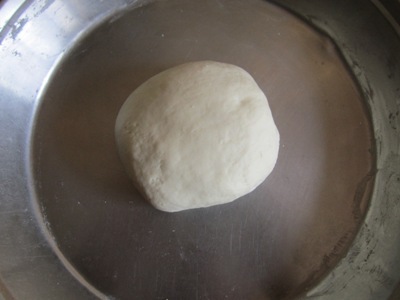 Add water to make a medium consistency dough and let the dough rest for 10 minutes. After 10 minutes knead the dough to make it smooth. 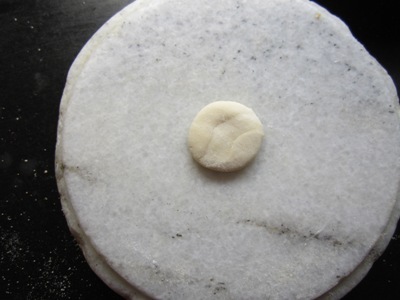 Extent the dough and cut into equal sizes. With the help of your palm press it. 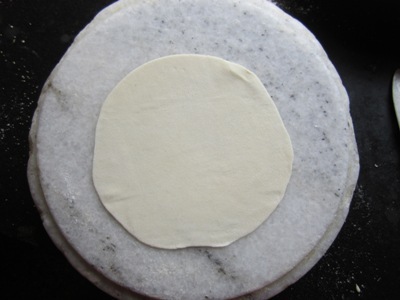 Place the ball on dusted board and roll it with the help of rolling pin in circle shape like poori about 4 – 4.5 inches. 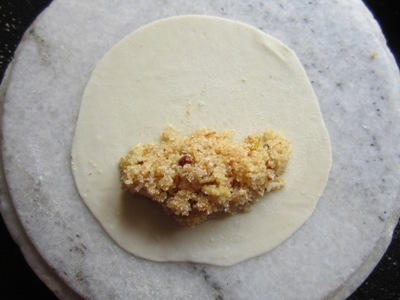 Add stuffing to one side of the puri and apply water around the edges. 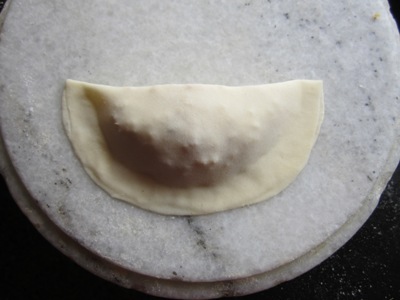 Seal the edges of the karanji well with finger tip. 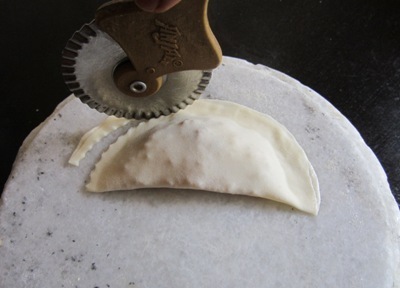 Use cutter to cut the excess edges of the karanji. 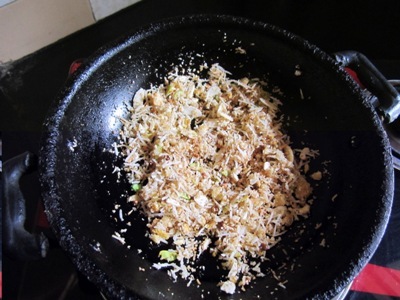 Add oil to the skillet and dip fry the karanjis at medium flame till it gets golden brown colour. Remove the karanjis on tissue paper to draw off the excess oil. Karanjis/Gujias are ready to serve and can be stored in air tight container for few weeks.